One of the great features of the iPod Touch and the iPhone is that you can hold thousands of photos on the device, and take them with you wherever you go. But, you may be sorely disappointed when you open the photos on your iPod Touch and find that they’re all listed alphabetically. This to you of course, will mean that you need to go through each photo individually to find the one you’re looking for and that the photos will not be sorted in any meaningful way on your iPod. Sue Day recently wrote into us to ask us how to fix this problem and we have found the answer for her, and the rest of you with this problem. Here are a couple of ways that you can create photo albums in the iPod Touch. Unfortunately, there is no way to organize your photos directly on your iPod Touch. But, you can try manually creating different folders and sorting your photos into them before syncing it with iTunes. To do this, just go into “My Photos” (for Windows users), create different folders, and then just place the photos into them accordingly. 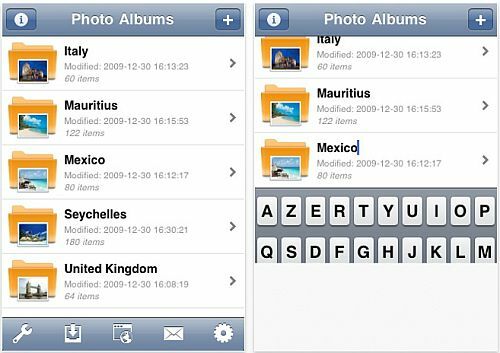 Leave them in the folders and the next time you sync your iPod Touch or iPhone with iTunes, you should be able to see all of your photos on your iPod separated into the different albums that you created. If you don’t want to go through all the trouble of manually sorting your photos, or you just want to be able to organize your photos directly on your iPod Touch, you may want to think about getting the Photo-Sort iPhone app. This iTouch app unfortunately isn’t free, but it does only cost $0.99 from iTunes. This cool iPod touch app will let you do just about anything you want with your photos. You’ll be able to sort them, delete them, rename both the photos and the album it sits in, and cut and paste – all right within the app! Plus the app will also automatically rotate the picture for you if it’s not taken in the right orientation, and it will always show you the first picture in any folder so you’ll always be able to tell what pictures a folder has in it. We hope that this helps Sue, and anyone else who’s trying to organize their photos on their iPod Touch!